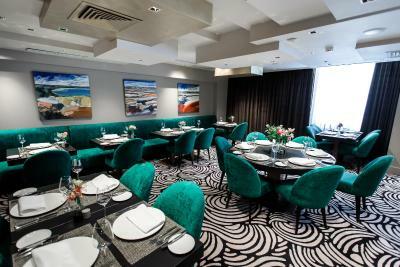 Lock in a great price for Domina St.Petersburg – rated 9.3 by recent guests! 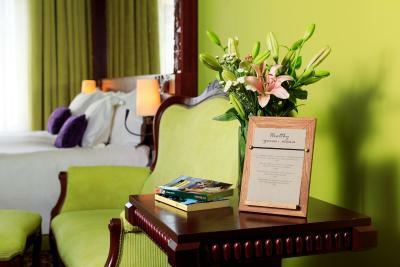 I loved the location, the room especially the bed, the breakfast and the staffs were very helpful and accommodating. Great location, great staff. Beds were comfortable, fluffy towels, nice robes. 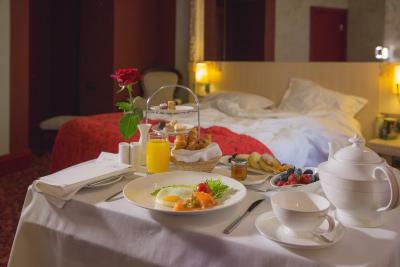 Breakfast was good, rooms clean but you never feel stars of hotel! The location is great, the breakfast was good and the staff were friendly and helpful. Very helpful staff and a lovely touch of sparkling wine and cake on my birthday! The staff at front desk, concierge and door attendants were all friendly, helpful and gracious. 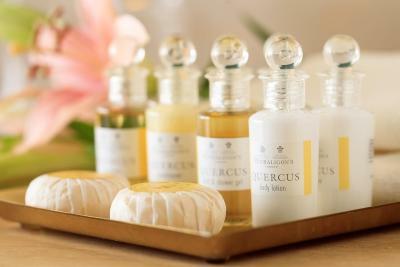 The room had all of the items and amenities associated with a first class hotel. The room was clean, very comfortable beds, bathroom amenities covered all items that would be required of a person arriving without luggage. The breakfast was splendid, replenished frequently and no out of stock on any of the selections. The food preparation was tasty, fresh and special orders (like eggs over easy) were accommodated. The location is near all points of interest. The concierge arranged taxi pick up to take us to Catherine's Palace(26 km) and who then met us there to bring us back to the hotel. 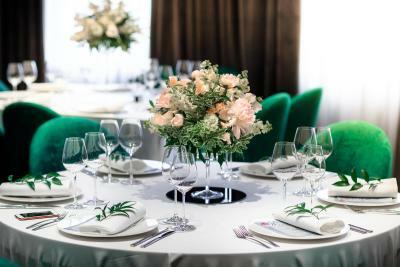 Concierge Personnel, -Tamara Layrut Concierge -Daria Gerasimova Concierge -Natayla Baregamyan Concierge were exceptional in making arrangements and recommendations for restaurants, sites and fun. 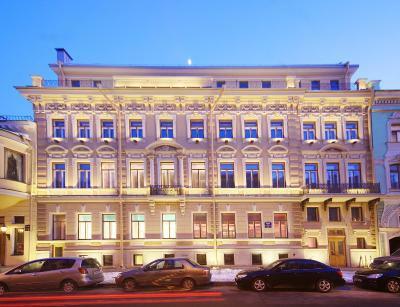 If you are going to Saint Petersburg stay here. You'll be glad you did. Very comfy beds and amazing location. Great deal for the money. A quirky boutique hotel but overall a great place to stay. Highly recommend getting the upgraded river view deluxe room. Domina St.Petersburg This rating is a reflection of how the property compares to the industry standard when it comes to price, facilities and services available. It's based on a self-evaluation by the property. Use this rating to help choose your stay! 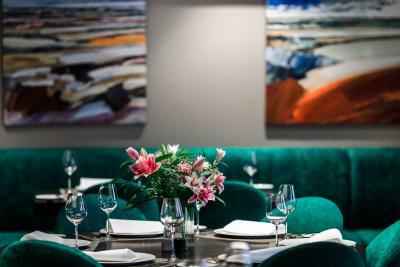 One of our top picks in Saint Petersburg.Located 2 minutes’ walk from St. Isaac’s Cathedral, this hotel offers air-conditioned rooms with free Wi-Fi and tea/coffee making facilities. There is also a 24-hour reception. 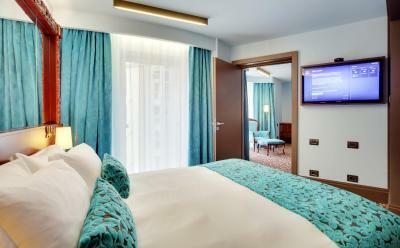 All the comfortable rooms at Domina Hotel feature extraordinary design. 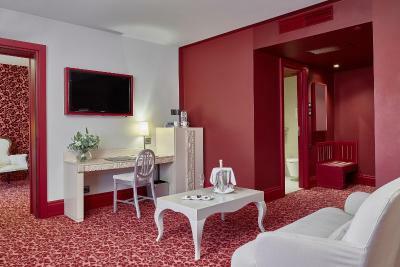 Every room has a work desk, a safety deposit box and a satellite flat-screen TV. Bathrooms come with slippers and bathrobes. 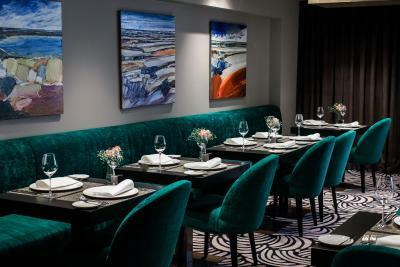 Arcobaleno Restaurant with a separate street entrance serves Italian cuisine as well as fusion specialties created by the chef. 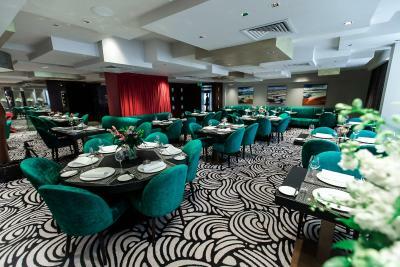 Guest can relax or arrange a meeting in Nove cocktail bar where a variety of events is available for attendance, including piano nights, film screenings, theme parties and enogastronomic workshops. St. Isaac's Square bus stop on Malaya Morskaya street is 2 minutes’ walk from Domina Hotel, providing a direct link to Moskovskiy Train Station. 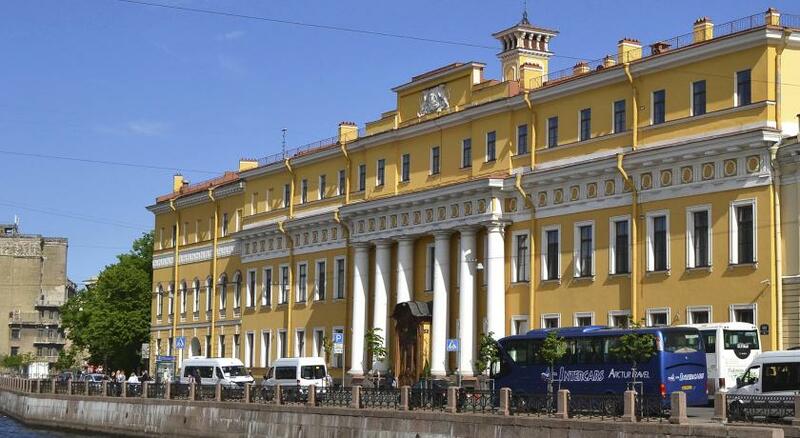 The Hermitage Museum is only 0.6 mi from the hotel, and Pulkovo Airport is a 30-minute drive away. 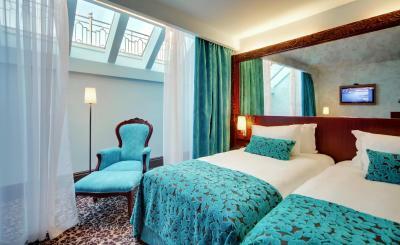 When would you like to stay at Domina St.Petersburg? 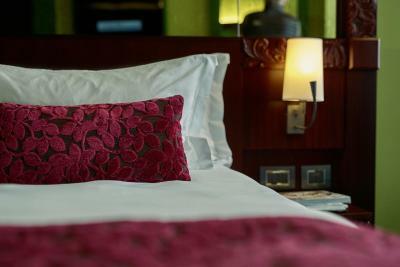 Spacious, air-conditioned room with tea/coffee-making facilities and a satellite TV. The bathrooms includes slippers and bathrobes. 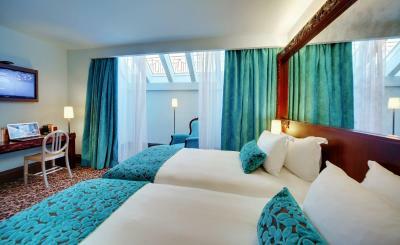 This room offers views of the atrium or Morskaya Street. 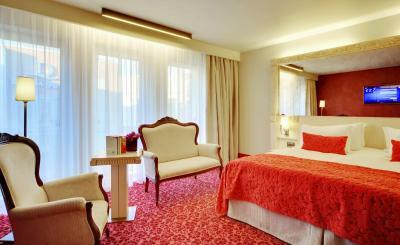 Spacious, air-conditioned room with tea/coffee making facilities and a satellite TV. The bathroom includes slippers and bathrobes. This room features mansard windows, which cannot be opened. Extra bed accommodations is not available in this room type. This room features a view of the Moyka River. This is a 2-floor room offering scenic views of Moyka River. 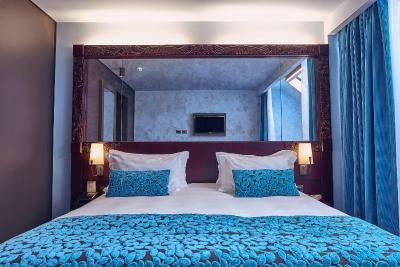 Spacious, air-conditioned suite with tea/coffee making facilities and a satellite TV. The bathroom has slippers and bathrobes. This suite has extra space and views of the atrium. This twin/double room has a soundproofing, bathrobe and mini-bar. This room features a private infrared sauna. 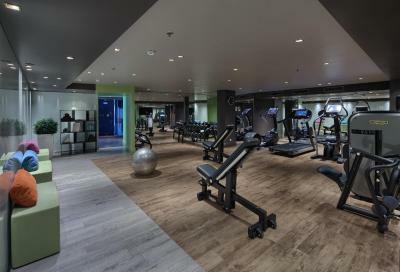 The access to the private fitness zone and lounge area is also offered. House Rules Domina St.Petersburg takes special requests – add in the next step! All older children or adults are charged RUB 2100 per person per night for extra beds. Domina St.Petersburg accepts these cards and reserves the right to temporarily hold an amount prior to arrival. Please note that visa support for foreigners is provided free of charge. In case of cancelation, 1500 RUB will be charged. Please note that Russian citizens are required to present the internal passport at check-in. Foreign guests need to present a valid visa and migration card. Please note the necessary requirement for the check-in procedure is presenting a credit card used for the booking. The guest, who made the booking, must be the holder of the bank card. Please note that this hotel reserves the right to preauthorize the credit card to verify its validity. Great location, friendly staff...great unexpected gift for birthday too. Marvellous. I loved this hotel but something did bother me, one day we came back a little early from our walk, our bathroom STUNK of cigarettes, we had to open the window wide. It was only once though and we got over it, loved this hotel! Have you ever looked back on your holiday and miss your hotel? Me either, until now! From start to finish we enjoyed this hotel very much! Our plane was delayed and along with passport control, we were actually an hour late to meet our hotel transfer, he waited! Also he was extremely friendly and a great introduction to this wonderful city. Would definitely reccomend getting a shuttle to the hotel, it was so easy and cheap. Next was our room, amazing. 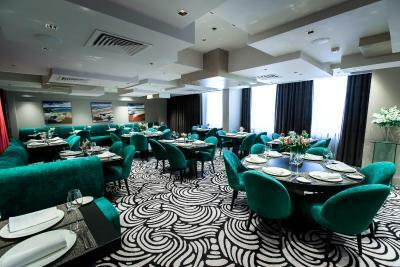 We personally loved the interior design, the room was HUGE and you could sense every single one of those 5 stars! We ate at the restaurant that night. I'm a vegetarian with little to no russian so I was worried I would struggle here, but it was fine! 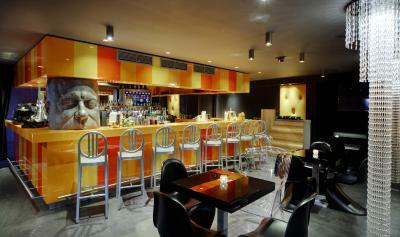 Staff spoke almost perfect English and were very helpful, food was also delicious. We also went to the nove bar, house/club music often played there and isnt really oir thing, however the staff even offered to play something else (without us asking!) We decided against it as so many people were enjoying it, but the gesture was nice all the same. Also the cocktails in Nove were DELICIOUS (and very very boozy for the price. Great!) Plus the barman really knows his stuff, i would order something and he would suggest something he thought I'd prefer, and was always right! 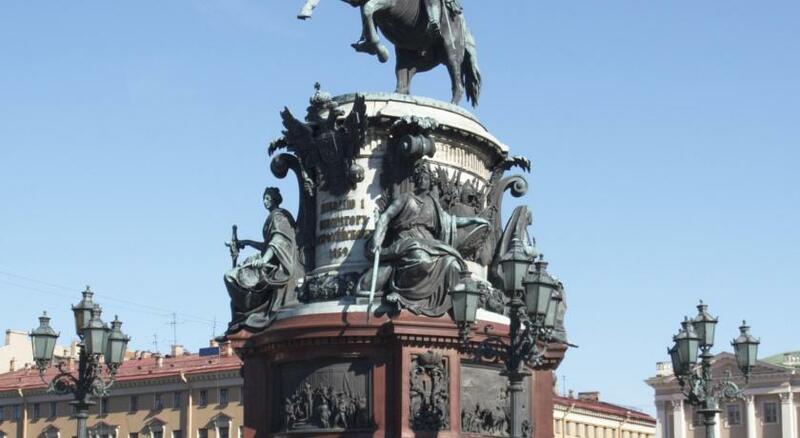 We got taxis almost everywhere during our stay in saint Petersburg (why not? They were really cheap and I'm not used to balancing on ice) and the hotel always booked these flawlessly, the concierge was very helpful! Very clean and classy hotel with all the trimmings! Very noisy..u can hear anything very clearly outside door ...a little far from metro..except this ,everything is perfect..
Apart from the colour scheme I had no problems. 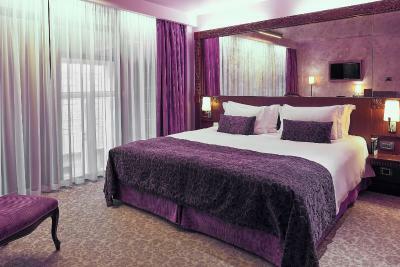 First off, I must say that the rooms were very comfortable and well appointed. The bed is extra large and very comfortable. The bathrooms are marble clad and fitted with the best fixtures. 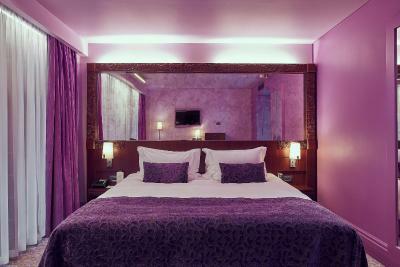 However (and this is not a negative - just a personal choice), the rooms are very brightly decorated in various hues of purple which might not be to everybody's taste. 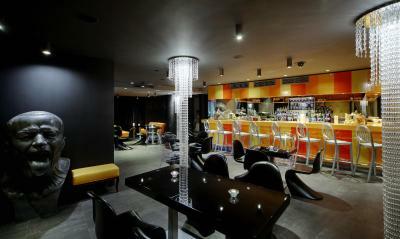 The bar and bistro area was a mixture of bright yellow, orange and black. At first this put me slightly off but after a few days I got quite used to it. The music in the bar changes every night from jazz to live bands to themed evenings - very enjoyable. The hotel is a 10 minute walk to most of the important tourist areas (i.e. Hermitage, St Paul's Cathedral and the Metro). Taxi's are cheap but there seems to be a constant bargaining / bartering to get to a price which can be tedious. Rather use Uber or let the hotel call for a taxi and negotiate a rate. 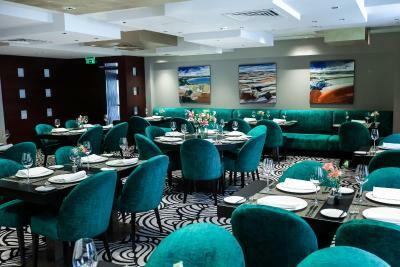 The main restaurant is beautifully decorated and more understated than the rest of the hotel. 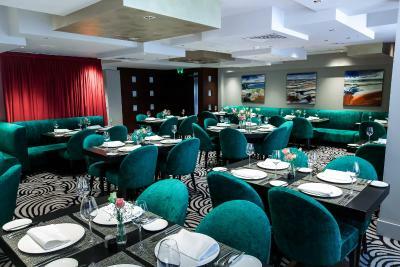 The staff are well trained and knowledgeable about the food and wine. The one meal I had there was good. The staff in the hotel were very attentive and helpful. Great hotel in St.Petersburg. Really interesting interior design. Very clean and comfortable. Pillow menu for a better rest. Really good value for money. Breakfast is big, so can easily be shared for two.